As Asian Americans living in the years of Amy Chua, Ajit Pai, Peter Liang and Nikki Haley, it’s easy to romanticize the Movement: those revolutionary years when “brothers and sisters” from Chinatowns, Little Tokyos, and Manilatowns across the country came together to stand with Black Power and confront the racist war in Vietnam. Together, they made pilgrimage to Manzanar, sat in at Wounded Knee, and walked out at San Francisco State University. Somewhere along the way, they invented “Asian America” as we know it. A crash course in the history of the Asian American Movement has become part of the initiation process for young newcomers to the Asian American left, and for good reason. And yet, the images that get circulated from that era—of Black, brown, and yellow brothers wearing leather jackets and berets, fists raised and packing heat—hint at a masculinist underpinning that’s worth unpacking. Take, for instance, the iconic image of Richard Aoki with Berkeley’s Asian American Political Alliance at a 1968 rally to free Black Panther Party co-founder Huey Newton. 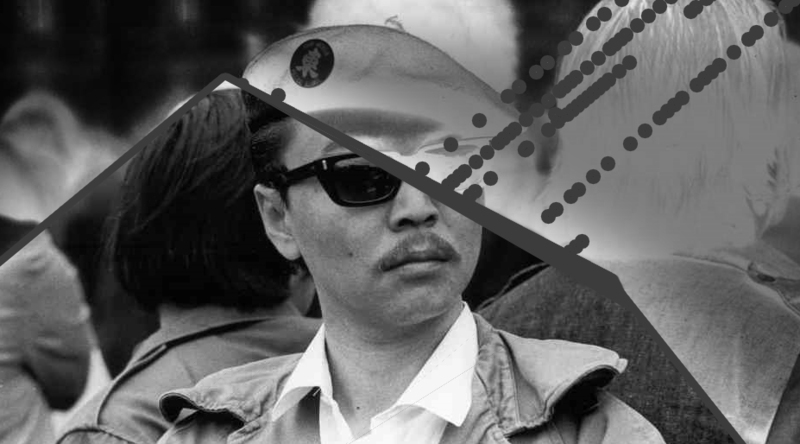 Aoki (who in 2012 was implicated as an alleged FBI informant) looks decidedly chic: clad in a black beret and sunglasses with a cigarette protruding from the corner of his mouth, he raises one hand in a fist while the other balances the now-iconic sign: “Yellow Peril Supports Black Power.” But reading this image and its circulation critically, we might ask: Is it Aoki’s revolutionary politics that resonates? Or is Aoki, as a Japanese American man embodying a militant kind of hypermasculinity, rendered iconic for easing modern anxieties about Asian male “emasculation”—that which Tamara Nopper calls “a homophobic and sexist preoccupation among many Asian Americans and our ‘allies’”?